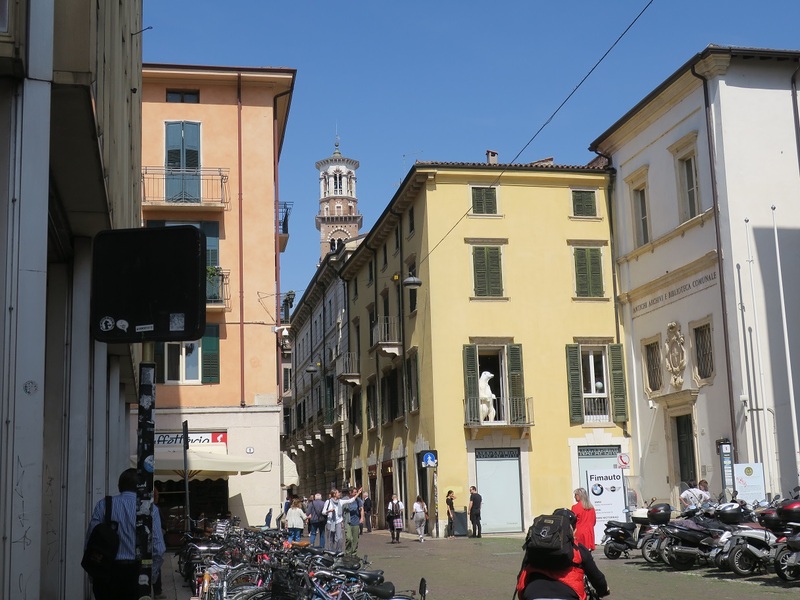 After a quick look around Juliet’s real fake courtyard, Patricia and I walked down the Via Leoni toward the Adige River. It was noonish and we were looking for a picnic spot, to finish off our leftovers from Gusto Leo the night before. 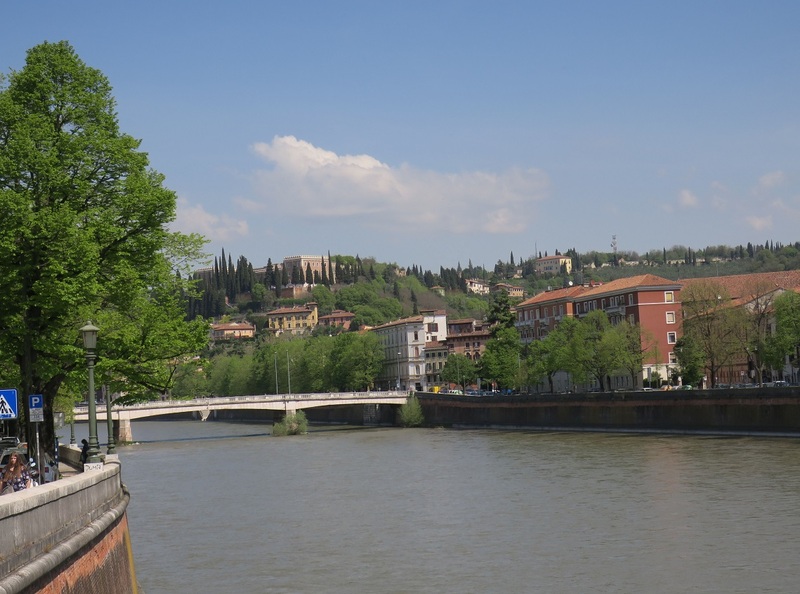 We wandered around the Ponte della Navi but could find no green space. So we settled for a bench, under a tree, in front of a church and we had our pizza surrounded by people who were wondering why we were taking up their bus stop space when we were so clearly not waiting for Bus 45 crosstown. We did wrap it up as quickly as we could and headed back up Via Leoni. 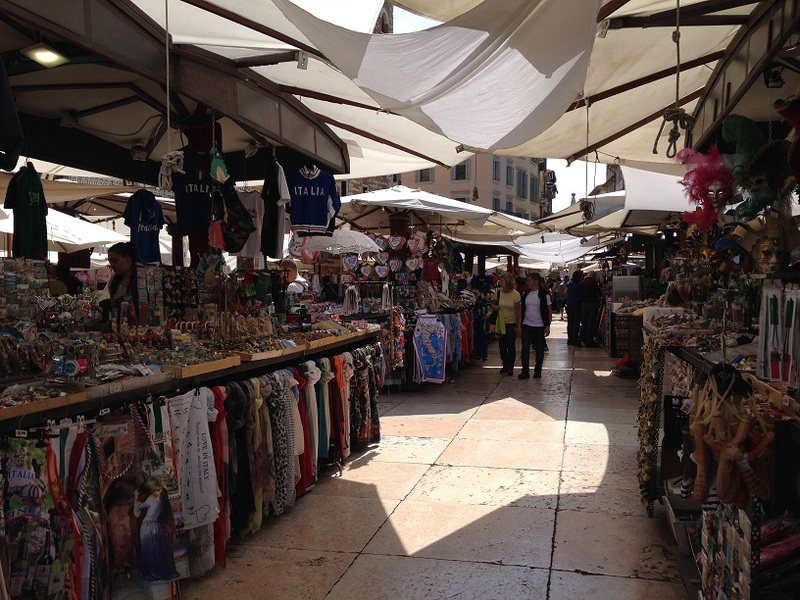 We’d seen a gelato place at the Piazza della Erbe that we wanted to check out. I loved this Moorish-looking building. In the middle of Via Leoni was a hole. There were no signs around identifying it but we agreed, in conversation with another American who was standing nearby, that it must be some sort of archaeological site. I searched for information on it after I got home, but all I could find was that they were Roman ruins. … and took in the lovely architecture. 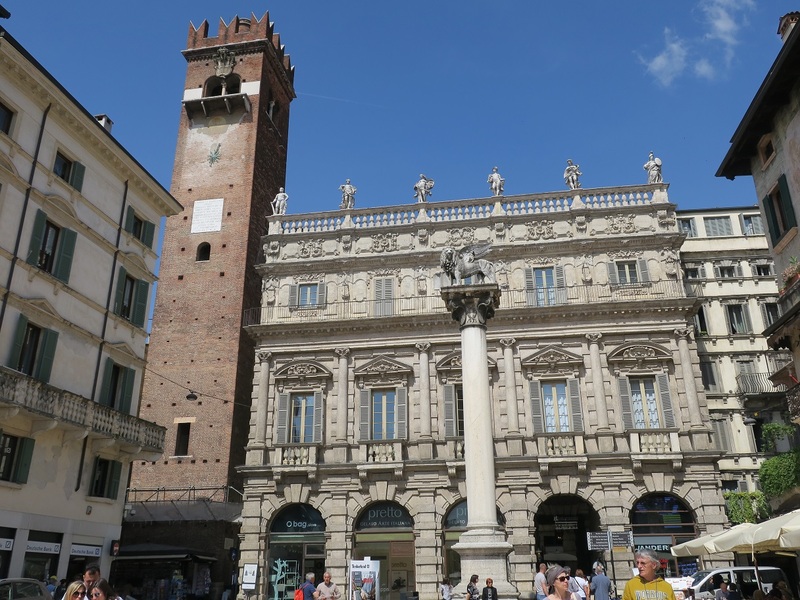 On the west side of the square is the Palazzo Maffei, a 15th century house that’s now a hotel. Of particular note are the statues of the gods lining the roof. 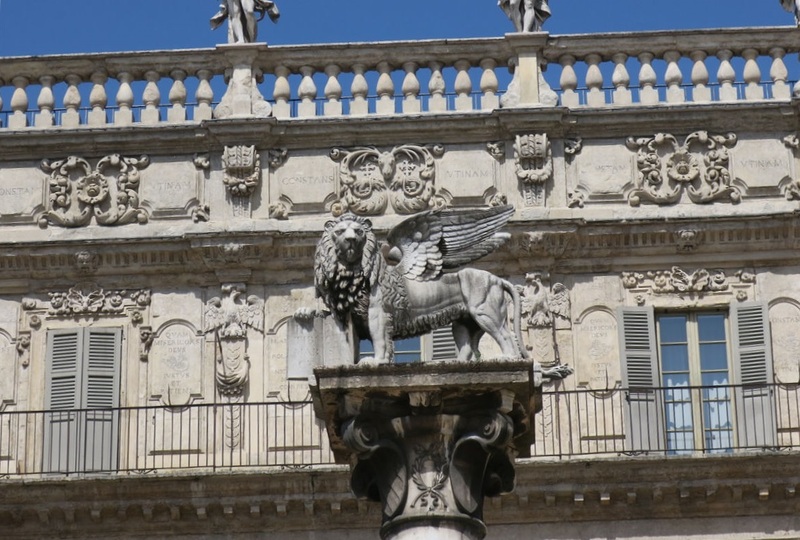 The Lion of St. Mark is on the column and on the left is the 1172 Lamberti Tower. It’s open for a climb for a fee. 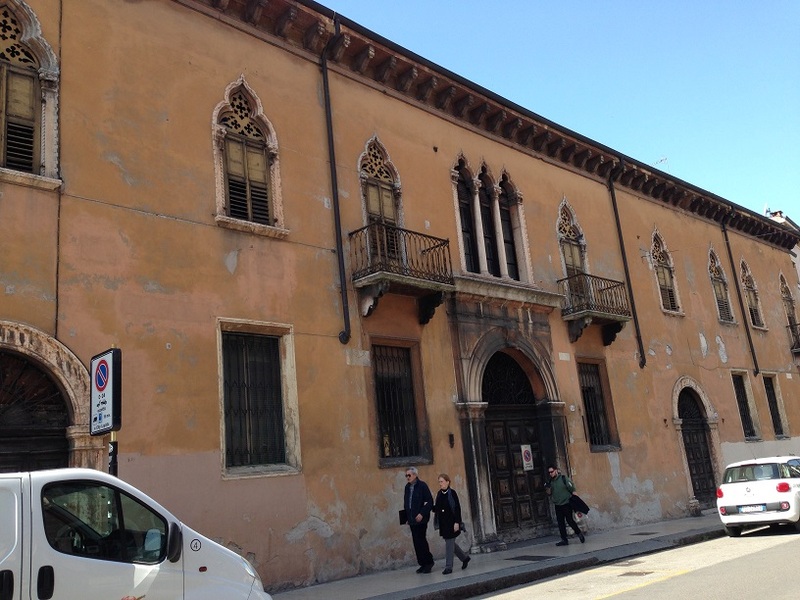 On the north side are the frescoed 16th century Mazzanti Houses. They, too, contain a hotel. 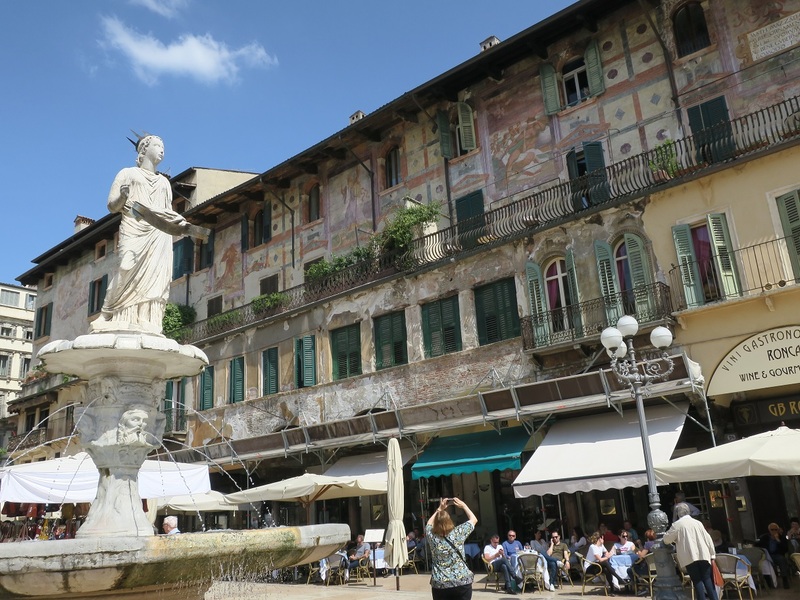 The statue on the 1638 fountain is called the Madonna Verona, even though she’s a 4th century Roman sculpture. We decided against the gelato place on the ground floor of the Palazzo Maffei because it looked just too fancy and too empty to be any good. 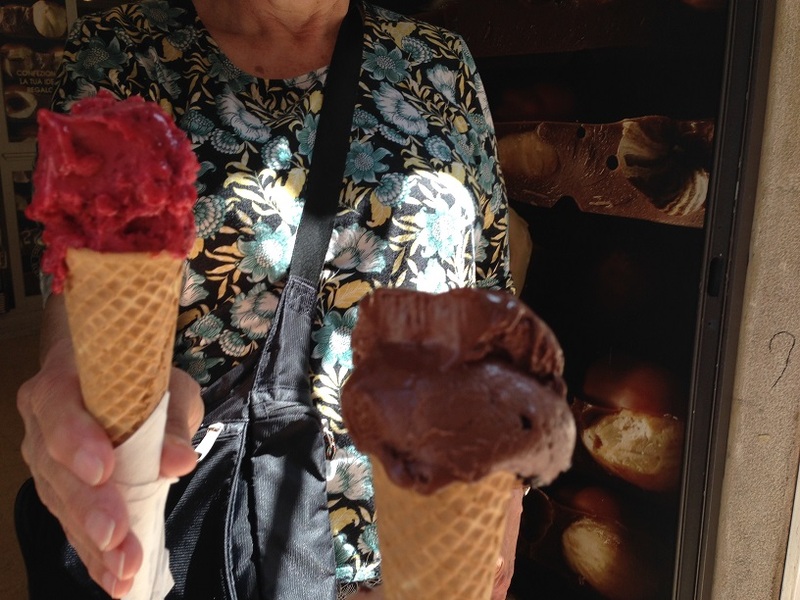 Yes, that’s how I judge my gelato shops — I look for not-dives but … rustic. This one looked like Neiman Marcus if Neiman Marcus were a gelato shop. 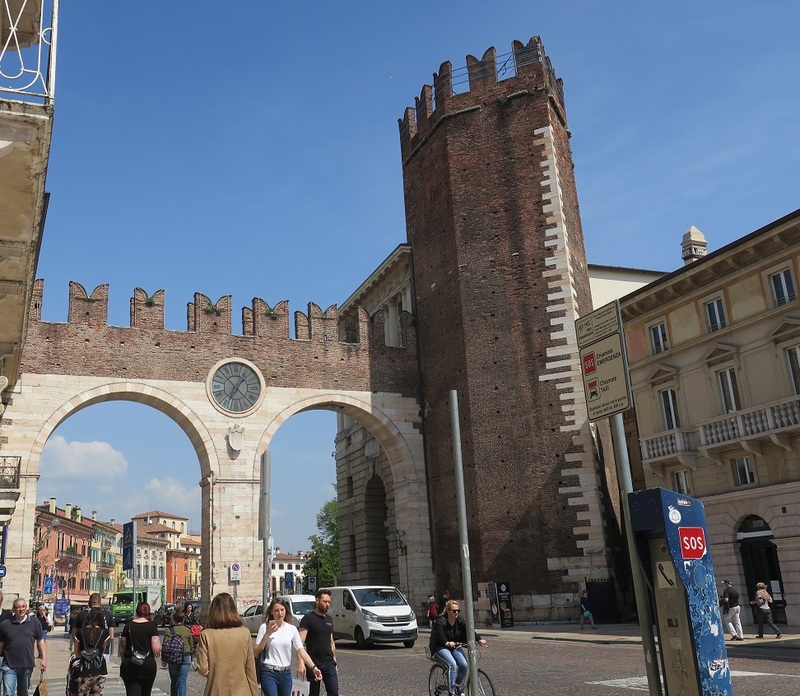 I was still on the hunt for gifts for my grandchildren, so we chose a likely street — the Via Mazzini — and headed back toward the amphitheater. There was Tiffany and Gucci and Louis Vuitton, but nothing that would entice one five- and two two-year olds. Or should I say: nothing that Baba was willing spend hundreds on, no matter how much she adored the grands. 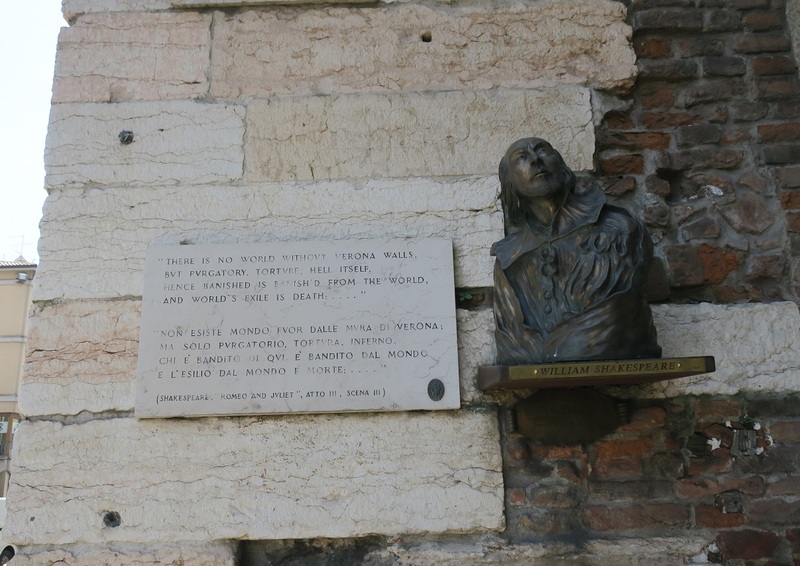 We ended up at the 16th century Portoni della Bra, the gates in the medieval walls of Verona, with a bust of Shakespeare and the stanza containing “there is no world without Verona walls” from Romeo and Juliet. The clock dates to 1872. The shops on the outside of the city walls proved to be less lux than the ones within, but I still didn’t find anything mostly, I imagine, because I wasn’t sure what I was looking for. I just knew that it had to be something small and easily portable, something quintessentially Italian and made in Italy, and something that would amaze and delight the young uns. Not asking too much at all. Somewhere around the city gates I made the first of two critical errors on our Gelato Tour of Italy. We found a perfectly good gelato place but instead of my usual stracciatella, I opted for chocolate. I could tell that the quality was very good but I was disappointed in the flavor. It was — I know, I didn’t think it was possible either — too chocolaty. Patricia’s was a berry sorbet. Berry sorbet! Really, why did she even come to Italy?! I recently watched the movie Letters to Juliet on Netflix, about a young American tourist who ends up helping the women who answer those notes left for Juliet. Volunteers for the city who work out of the Juliet House museum, they’re called “Juliet’s secretaries” and actually do exist. The film is beyond silly but they filmed in Verona, Siena and across the Italian countryside and the cinematography is spectacular, so I recommend it (if you don’t have to pay extra for it) on that alone. 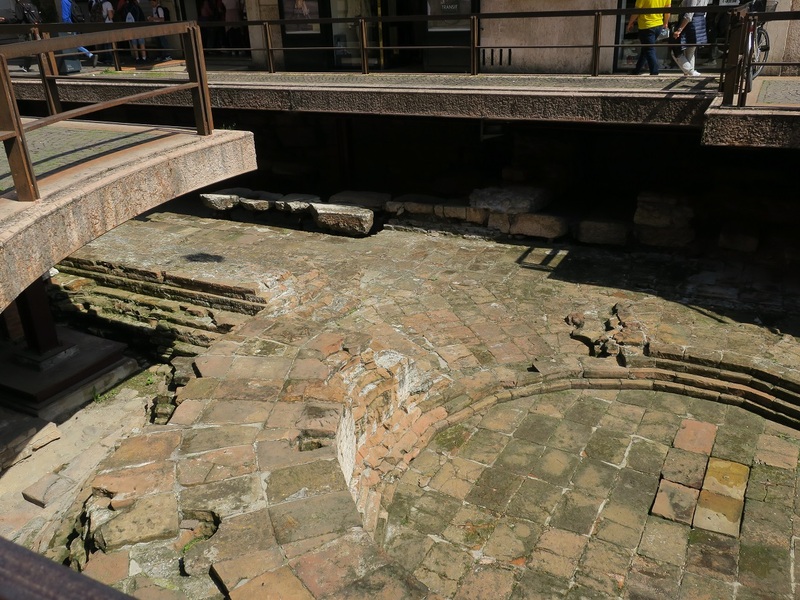 It seems that Italy has so many Roman ruins that it doesn’t get around to providing information on them all! It’s nice that they at least preserve the ruins and let the be seen, even when it’s to the detriment of local traffic.